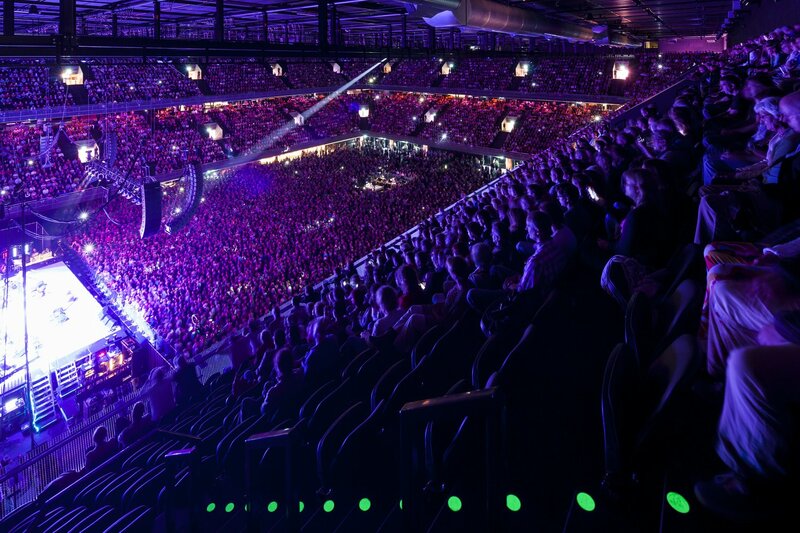 The Ziggo Dome has capacity for 17,000 spectators. The ArenA Boulevard, the heart of Amsterdam Southeast, is a key area of Amsterdam and greatly influences the appearance of the city as an international cultural, economic and tourist center. The boulevard is intended primarily for entertainment, shopping and a combination of sport, leisure, play and recreation. 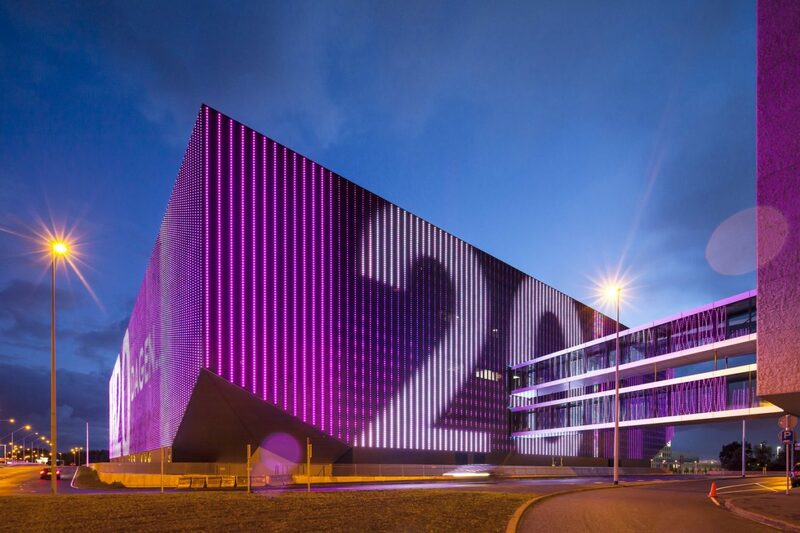 With easy access via train, bus and metro and surrounded by highways it is the ideal location for the Ziggo Dome, the Netherlands’ latest concert hall for 17,000 spectators. Concert halls with medium capacity were lacking in Amsterdam as well as in the rest of The Netherlands, while 80% of the concerts in the rest of the world and especially in the United States, are given in concert venues with a capacity between 12,000 and 20,000 visitors. Hence it was a deliberate choice to enter the international market of providers with the same capacity. Renowned artists create a show for a world tour especially for concert venues with such capacity. The stage, lighting and sound of the tours are adjusted accordingly and the Ziggo Dome is the first location in the Netherlands designed as the ideal venue for these artists of world class. Brightly lit and dark at the same time, the impressive Dome shall not go unnoticed when passing by. The building is covered with 120,000 LED fixtures, allowing the facade of the building to appear as a video screen on all sides. The 10,000 m2 video screen can be used for announcements or to show what is happening inside. Closer to the building the individual lights and the pattern of the facade in which they are incorporated, become visible. The experience for visitors is essential in the design. Especially acoustics, sightlines and atmosphere are important factors that contribute to a spectacular musical experience. 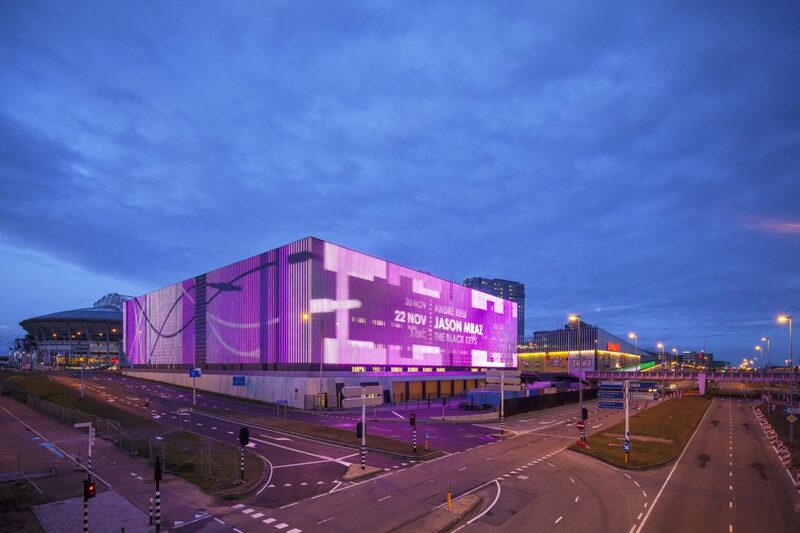 The design principle of the Ziggo Dome is: ‘single-purpose design, multi-use’. The venue is specially designed for amplified music, but with minimal modifications, the venue can be made suitable for tennis matches, an Olympic swimming pool or a skating rink. Acoustic material is incorporated in the walls, stands and ceiling which limits the reverberation time in the hall to a minimum and creates dry acoustics. Behind the walls lies an area that provides the necessary sound insulation, and also includes other features such as stairwells, offices, restrooms and banqueting opportunities. The exterior wall is shaped like a bell-jar around the building, which ensures that the sound vibrations will not get out. On the ceiling of the Dome all desired sound systems, lighting and decor can be fixed. 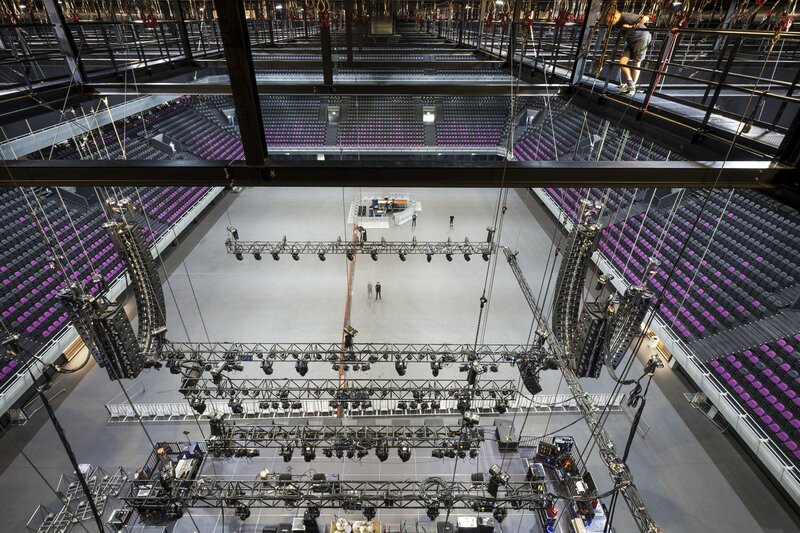 The roof is so strong that without additional measures a hundred tons of lights and speakers can be hung. This roof structure makes it possible to give the space a new form and content in a short period of time. There is flexibility in the ambiance as well. The black room is neutral in color, so any atmosphere can be created with the right lighting. Not only the thrill of a performance, but also the experience of all aspects related to a show are optimized. The clear access, many toilets, sufficient catering opportunities and the U-shape in which the seats are positioned, contribute to an atmospheric evening. The building is a big hall divided into six layers: a basement, ground floor and four floors op top. Visitors with a ticket to the ground floor, stay on that level during the whole concert and find all necessary amenities such as a cloakroom, toilets and catering in the foyer that stands in a U-shape around the hall. The concert hall and lobby function as one area, where visitors can move around without passing a door. Depending on the number of visitors to a gender, the number of toilets can be adapted. Due to the design of a movable wall between the toilets, more male or female toilets can be created as desired. Divided over the four floors, two tiers of seats are accessible by stairs and elevators. Two lounges are in open communication with the hall and reachable via the stands. Each lobby has its own toilets and catering. Visitors are separated upon entering the building in accordance with their spot on the ground floor, lower or upper tier or VIP area so everyone can get efficiently and quickly to his seating. VIPs can enter the building through the front door on foot or drive into the garage, that is situated under the building. The tier of the VIP seats has its own facilities. In the ‘backstage’ section on the ground floor all functions associated with loading and unloading, catering and waste disposal are situated, including installations and storage. On the higher levels there are dressing rooms, offices and ‘star rooms’. By installing thirty stairs, the venue can be empty within three minutes in case of emergency. 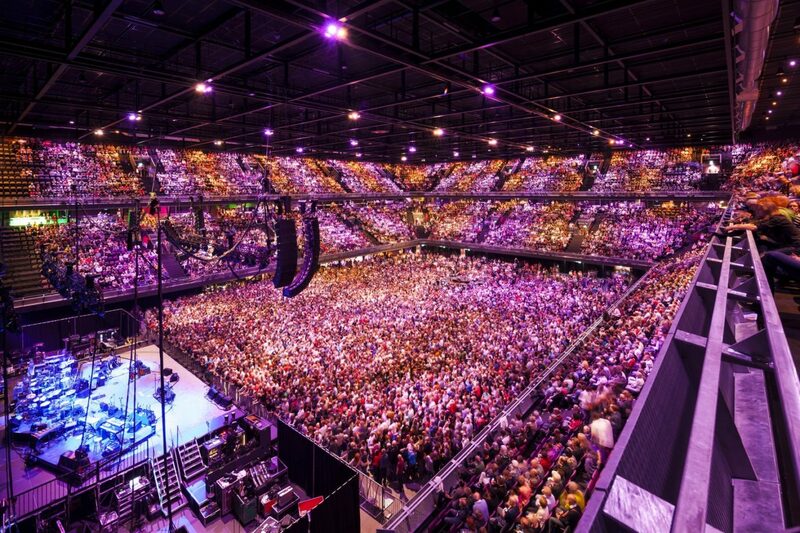 In the first half year after opening a lot of great artists, including Pearl Jam, Madonna, Lady Gaga and Muse gave concerts in The Netherlands’ largest concert hall. In time, more than one million visitors and more than 100 events per year are expected.